We believe that our patients are the best judges of the quality and service of our dentistry in Greensboro, North Carolina. Read what our patients are saying about us below. 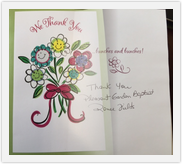 We have loved working with your dental office. Your entire staff was friendly and supportive, and your commitment to providing your patients with the best information and resources is evident. We enjoyed meeting your professional staff and have to say you are the most personal down to Earth dentist that we have ever met! Thank you for now accepting Delta Dental Insurance. This has helped our family greatly. Thanks for helping my dad last Monday and for removing the pain from his mouth and being so caring. Thank you so much for donating to our class basket. We will now be able to get some much needed things for our classroom. Thank you very much for taking time out of your Saturday to see J. Your treatment relieved his pain & I am sure you saved him from worse. We look forward to many years as your patients. Doctor Scott, I love what you have done to the office. I have been coming to Gary for over twenty years and was worried about a new dentist. Your attitude and the new look has brought life back into the building and I am sure your will be successful here. You have exceeded my expectations and our family are so happy you choose to make Greensboro your new home! Thank you and your wonderful nurses (dental staff) for taking such quick and good care of me. I will highly recommend your practice to everyone. Thank you for supporting me and the Southeast High School Marching Band. Thank You for Donating to our class basket. It was such a help in earning money for our classroom. Just a little not to say I appreciate what you did for me. I know you did not have to, thank you so much. Have a meal on me! Wow! Your willingness to be involved with our dental bus ministry speaks volumes to all of us, of your heart. Thank you for caring for those who have needs, but are unable to obtain the care and treatment for them. You gave a gift of love by providing special care, and you blessed the entire community. A special note of thanks to you....for all your special help. Your expert service or our friendship is never taken for granted. We Thank You ... bunches & bunches! You fixed my smile! I had a chipped front tooth which you fixed so well it looks like the chip never happened. I'm amazed! My tooth looks exactly like it did before my accident! Thank you! Thank you! Thank you! My sister and I would like to take this opportunity to thank you for taking such great care of our dad. We realize that the work you did on him was extensive and we can't tell you how much that has meant to him, being a senior citizen on a limited income. Personally knowing what the charges should have been you have taken a massive burden off of him financially. Both you and your office have been very kind to him in many ways. I can't thank you enough. Sincerely, K.
Thank you so much for al your kindness and help! Thank you for all the T.L.C. you give me and my family! This was an amazing experience! Thank you for the help with my Grandmother! Thank you guys for everything you do. We love working with you and your sweet patients! Thank you so much for your very generous donation to our campaign event! We appreciate you & your support. Because of business & donors like you, we are able to have a positive impact on the youth in our community.